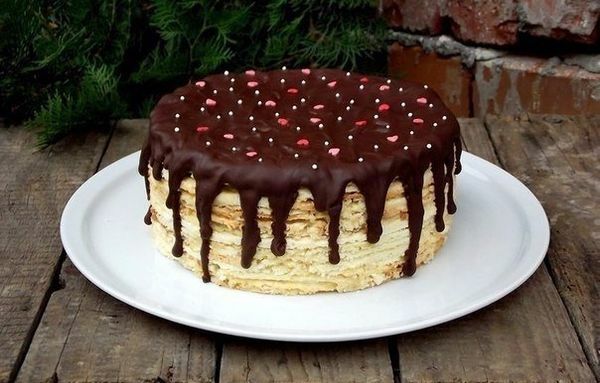 To prepare this cake does not need any sophisticated and exotic products. Only the usual ingredients – flour, sugar, sour cream, condensed milk… But what a result! Gorgeous! The cake is very tasty! And what an incredible cut! *For the sweet tooth you can add some sugar or cream or dough. 1. Sugar mash with butter, add eggs, sour cream and soda. Knead well. Gradually add the flour. You can add a little less than 3 cups. The batter should be a little softer than the dumplings. Remove for 30 minutes in the refrigerator. 2. Divide the dough into 12-15 pieces and roll out thinly, if necessary adding the flour. Better to roll out the cakes on the baking paper. Cut the cake in size as possible at the stage of rolling and after baking. The last option seems more convenient. Before baking the cake, pierce in several places with a fork. 3. Bake cakes at a temperature of 190 degrees to a small Browning (about 3-4 minutes). Do not over steep, otherwise the cakes will be dry. Hot to cut the cake pattern. Trim save for sprinkles. I got 13 cakes with a diameter of 21 cm + scraps, which prepolovenie children. 4. For cream vzbit cream with boiled condensed milk. You can adjust the sweetness and consistency with the proportion of condensed milk in the cream. The cream should be neither thick nor runny. He should be good to go, not emerging, and at the same time must be well impregnated with neutral layers. 5. Leave the cake at room temperature for 3 hours, and then refrigerate, preferably overnight.